Backyard Bushel is one of the many farms that enjoy coming to the Market. That is a good sign; happy farmers equals good vegetables. They grow a wide variety of veggies and botanicals (flowers). We enjoy buying from them because 1. Nice farmers 2. Flavorful vegetables 3. Pretty botanicals. We interviewed Ms. Shelley, one of the farmers of Backyard Bushel. She gave us great answers to our curious questions like… When we asked what do you like about being a farmer? She said mostly that she gets to be outside growing the food she eats, she loves being sustainable (not relying on grocery stores for food) and being able to supply healthy foods to her market customers. Ms. Shelley loves the great community that the market provides. It is a HUGE social hour for her. She does not get to see a lot of her friends during the week because she lives 40 minutes away from them. 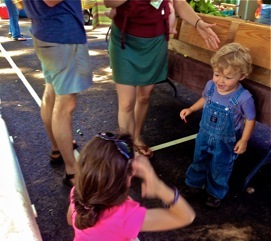 So the Athens Farmers Market is her connection, she gets to see them each week! Another highlight for Ms. Shelley is that she gets to eat other wholesome foods besides what she grows! That sounds yummy!! So why the long time between blog posts? We just got home from NY! We visited a really cool farmers market there called Clarence Hollow Farmers Market. While we had a fabulous visit it’s nice to be back at ‘our’ Market!